MO-TF1 has been activated by the Federal Emergency Management Agency (FEMA) to deploy as a 16-person Mission Ready Package – Water (Type 1 Swiftwater Rescue Team) to Florida in support of Hurricane Michael. The task force was activated at 1800 hours this evening. The team will depart Boone County Fire District Headquarters at 0700 hours tomorrow morning. They must arrive at their staging location, Eglin Air Force Base, by 0600 hours on Wednesday, October 10th. #MOTF1 is on the road again headed to Florida ahead of #HurricaneMichael. Just ten days ago, MO-TF1 returned home from North Carolina and Hurricane Florence and are now deployed to Hurricane Michael. The team was activated yesterday evening by #FEMA as a 16-member Swiftwater Rescue Mission Ready Package. The team departed this morning from Boone County Fire Protection District Headquarters enroute to Eglin Air Force Base in Florida where they will stage and await a mission assignment. MO-TF1 has also deployed a member as part of the FEMA Incident Support Team who will assist with managing FEMA resources deployed in the region. These assignments could be as long as two weeks. MO-TF1 arrived safely at Maxwell Air Force Base in Montgomery, AL this evening. The 16-member Swiftwater Rescue Mission Ready Package was diverted to Maxwell AFB while en route to Eglin AFB in Florida. The team arrived at 9:00 pm local time (CDT). The team will stage at Maxwell AFB until they receive a mission assignment or orders to relocate to a different staging area. Currently, Hurricane Michael is a Category 3 hurricane and is forecast to be near Category 4 strength when it makes landfall near Panama City, Florida. MO-TF1 remains in staging at Maxwell Air Force Base in Montgomery, Alabama where they arrived late yesterday evening. 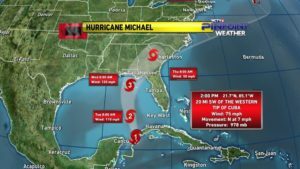 This morning, crews were checking equipment and preparing for Hurricane Michael to make landfall along the Florida Panhandle, more specifically Panama City. We would anticipate numerous water rescues along the coast and inland across the Florida Panhandle, Georgia and potentially South Carolina and North Carolina. We will continue to update on our mission assignments as information is received. MO-TF1 is currently on the road from Maxwell Air Force Base in Montgomery, AL to Panama City, FL. MO-TF1 has been assigned to Panama City to assist the state and local assets with search and rescue missions. The 16-person Swiftwater Mission Ready Package is being joined by three other MRP’s from IN-TF1, VA-TF1 and OH-TF1. MO-TF1 is also sending three additional members, to support the FEMA Incident Support Team. Those members are leaving early this morning headed to Pensacola, FL. On Friday, Missouri Task Force 1 continued to perform search and rescue operations in Panama City, FL. MO-TF1 evacuated 1 resident, completed wellness checks on 926 residents that remained in their homes and provided assistance to 13 residents. The teams also performed damage assessments on 928 structures and searched 42 vehicles. Today the task force began operations at 0800 hours. They were assigned an area north and west of Panama City. The team searched an area south of Highway 388 from Highway 79 to Burnt Mill Creek. The area is rural and many of the residences have been isolated since the storm. The team completed wellness checks on 125 residents that remained in their homes and provided assistance to 5 residents. The teams also performed damage assessments on 187 structures. The team concluded operations at 1400 hours and returned to their Base of Operations (BoO). They demobilized from their BoO on the parking lot of the Panama City Mall and moved to a new BoO on the campus of Gulf Coast Community College. Once there they received their first shower and hot meal since Thursday morning. Tomorrow morning the team will travel north to Jackson County where they will report to the EOC in Mariana and receive their mission assignments for the day. Tonight, FEMA activated 12 Human Remains Detection (HRD) Canine Search Teams to deploy to Florida to assist ground search teams during their operations. MO-TF1 will deploy three HRD Canine Search Teams tomorrow morning at 0700 hours as part of that activation order.